Mix the powdered sugar and ground almonds together. In a clean bowl, add your aged egg whites and salt. With an electric mixer, beat on low until frothy. Turn up the mixer to high and slowly add in the granulated sugar as you continue to mix till the whites are stiff peaks (when you lift up the mixer, there should literally be stiff, shiny peaks). With a spatula, gently fold in the powdered sugar/nut mixture until incorporated. 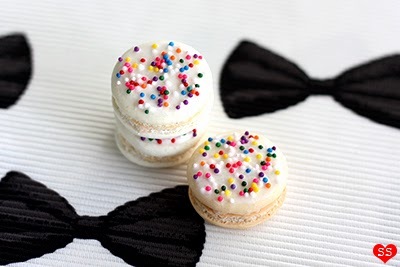 Place a plain piping tip in a piping bag and fill the bag with your macaron batter. Now take that circle stencil and place it under a piece of parchment and use as a guide as you pipe out your macarons. When done, slide out the paper, place it under your other parchment, and repeat. Let your macarons dry for a few hours, until the tops are completely dry. [To keep your macarons shells white colored while baking, the top heating element of your oven needs to be covered before preheating the oven. This can be done in one of two ways. Make sure your oven is completely cooled down before attempting either method. Method #1 (the one that I used): Move your top oven rack to the highest position. Cover the entire rack with sheets of aluminum foil so that the rack you'll be putting your tray of macarons on below is completely shadowed. The point is so the heat from the top heating element won't directly touch your tray of macarons while baking. Method #2 (I haven't tried this yet, but theoretically it should work): Your oven absolutely has to be cool to attempt this so you don't burn yourself. Use aluminum to wrap the entire top heating element of your oven. Preheat the oven to 325°F. Bake your trays one at a time for 8-10 minutes or until the macarons are set on top. Let them cool on the parchment on a cooling rack. When cool, carefully peel the shells off the parchment. Pair all the macarons up by matching size. Decorate one of the macaron shells as indicated below. Fill a piping bag with almond filling (recipe below), pipe filling onto the non-decorated macaron shell in each pair, and sandwich the filling with the decorated matching macaron shell. Once done, refrigerate the macarons to let the flavors meld. Cream the butter and powdered sugar. Mix in the almond extract. Color the sugar cookie icing with the black food coloring. 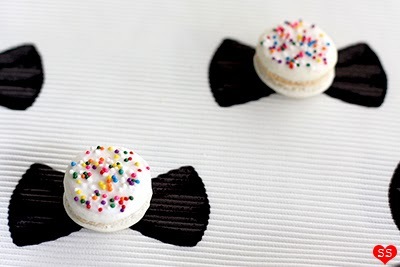 Use a toothpick to trace out two triangles on a macaron shell to make a bow tie shape. 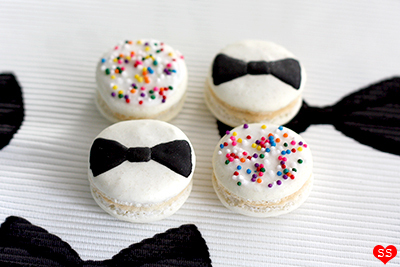 Repeat with other macaron shells. Let the icing dry. Then trace a small rectangle to cover where the two icing triangles touch to finish off the bow tie. Let the icing dry before filling the macarons. 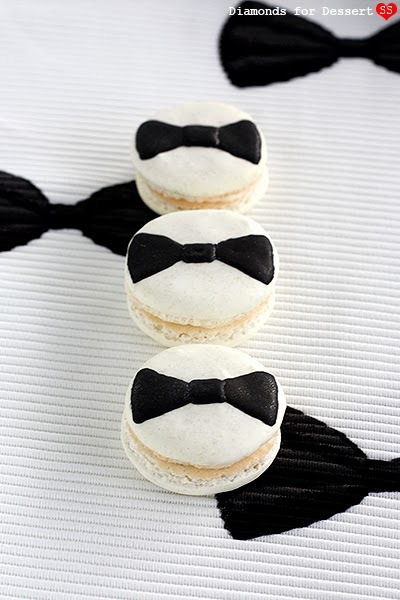 If using the pearl dust, after the icing dries, use a clean paint brush to brush a small amount of pearl dust on each icing bow tie. Spoon some uncolored (white) sugar cookie icing onto the macaron shell. Spread the icing out to cover the top of the shell. Sprinkle some nonpareils onto the shell. 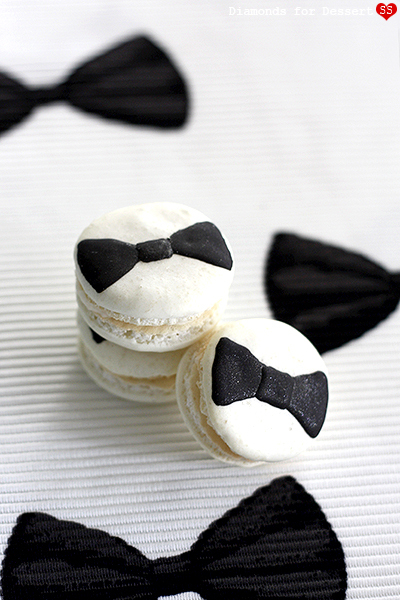 Repeat with the other macaron shells. Let the icing dry before filling the macarons. Gorgeous idea! And what a cute dress! Oh, thank you for the idea for the dessert for my next James Bond themed party. I'm late to this post but I thought I would tell you that I use white food coloring to make my macarons really white (like for snow men). I add it to the batter at the very beginning of the macronage. 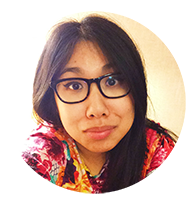 Your macarons are gorgeous! !